Ihre Anfrage wird als E-Mail an die bei uns hinterlegte Kontaktperson bei DECHEMA e.V. geschickt. In addition, we administer funding programmes as well as national and European research clusters. As a member of AiF we organize industrial cooperative research projects. Together with DECHEMA Ausstellungs-GmbH we are the organizers of ACHEMA, the world forum for the process industry. 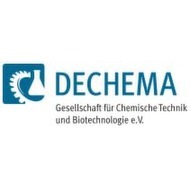 We work closely with DECHEMA-Forschungsinstitut, which is dedicated to research for sustainable technologies in the fields of biotechnology, materials and chemical engineering. DECHEMA Ausstellungs-GmbH draws on the technical and organizational expertise of DECHEMA for the organization of capital goods fairs. Together with DECHEMA Gesellschaft für Chemische Technik und Biotechnologie e.V., we are the organizers of ACHEMA and AchemAsia.